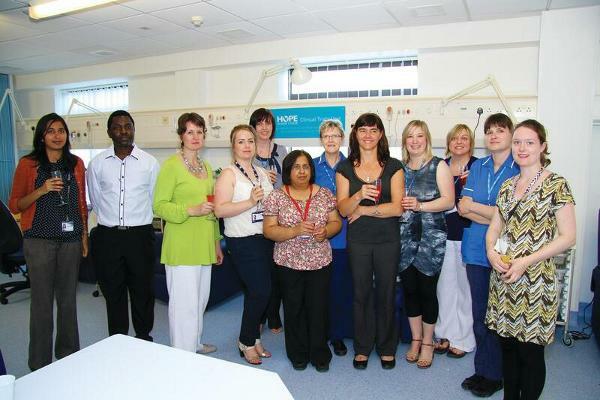 Former England Rugby Captain and Manager, Martin Johnson CBE, officially opened the new Hope Against Cancer Clinical Trials Unit for cancer patients from Leicestershire, Rutland and beyond on Thursday 24 May. Based at the Leicester Royal Infirmary and funded by Leicester’s Hospitals and Hope Against Cancer, the unit will provide the East Midlands with a centre for the latest clinical cancer research. laboratory. By having these great facilities it will allow experts at the University and hospital to carry out more studies whilst providing a better environment for those patients taking part. We now have a dedicated clinical space to treat patients taking part in early research studies. This means that we provide cutting edge cancer research for the patients of Leicestershire and Rutland, and also receive referrals from the rest of the UK.